3 beds1 + 2 baths1110 sq. ft.
3 beds2 + 1 baths1321 sq. ft.
4 beds3 + 2 baths3813 sq. ft.
4 beds2 + 1 baths1186 sq. ft.
2 beds2 baths1218 sq. ft.
4 beds2 baths908 sq. ft.
2 beds2 + 1 baths1273 sq. ft.
3 beds2 + 1 baths1288 sq. ft.
3 beds2 + 1 baths1330 sq. ft.
4 beds2 + 1 baths1182 sq. ft.
3 beds1 baths1001 sq. ft.
4 beds3 + 1 baths2677 sq. ft.
1 beds1 baths608 sq. ft.
4 beds3 + 1 baths2267 sq. ft.
2 beds1 baths660 sq. ft.
4 beds2 baths1044 sq. ft.
3 beds2 + 1 baths1252 sq. ft.
2 beds2 + 1 baths1254 sq. ft.
4 beds3 + 1 baths1757 sq. ft.
2 beds2 + 1 baths1196 sq. ft.
1 beds1 + 1 baths1178 sq. ft.
3 beds2 + 1 baths1960 sq. ft.
4 beds3 + 1 baths1805 sq. ft. There are a variety of property types to choose from when looking for real estate in Calgary. There are 5,474 houses, 1 townhouses, and 1,506 condos for sale. For past listings, search our Calgary sold listings and Calgary expired listings The average listing price in Calgary for all home types is $577,911, which is 10% higher than March 2018. The average list price differs significantly when broken down by home type. The average listing price of a house is $644,993, $242,000 for a townhouse, and $335,227 for a condo. There are many popular cities surrounding Calgary, including Airdrie, Red Deer, Lethbridge, Stony Plain, Spruce Grove, Edmonton, St. Albert that offer a variety of home prices and unique areas to live. Calgary also has many options for renters with 6,985 active rental listings and an average lease price of $3,699. Calgary is home to 247 unique neighbourhoods. Popular neighbourhoods include South Downtown, with 185 active real estate listings, Connaught, with 185 active real estate listings, and Symons Valley, with 164 active real estate listings. Residents of the City of Calgary are expected to pay property taxes on all residences that they own. Property taxes can usually be found on each active Zoocasa listing, or can be looked up here. As of 2017, the estimated property tax residents can expect to pay is 0.40% on municipal tax and 0.25% on provincial taxes. This adds up to a total tax rate of 0.65% for 2017 year. As of January 2018, Albert and Calgary do not have any land transfer taxes, but it does charge a mortgage registration fee and a title registration fee, which are common among other major cities in Canada. The Title registration fee includes a base fee of $50 + additional $1 charge for every $5,000 of the fair market value of the property. The Calgary Real Estate Board (CREB) was founded in 1929 and has over 5,200 licensed real estate brokers across the Calgary region. CREB is primarily focused on the city of Calgary. Situated on the foothills of Canada’s Rocky Mountains where the Bow and Elbow rivers meet, Calgary packs not only natural beauty, but nightlife, and cool eateries, too. It is the major urban centre in Alberta and the first city in Canada to host the Winter Olympic Games. Calgary also elected North American’s first Muslim mayor and is host to “The Greatest Outdoor Show on Earth”- the Calgary Stampede! Home to over 1.3 million in the metropolitan area, Calgary is 4th largest city by population in Canada. It is no surprise then that Calgary has been ranked 5th most livable city in the world by the Economist Intelligence Unit from 2009 to 2015. Unlike Canada’s other two major cities, Vancouver and Toronto, housing supply is quite abundant in Calgary, boasting greater affordability. Calgary has one of the youngest populations in Canada, with the 37.4 the average age among its 1,392,609 residents. According to the 2017 Canadian Census, Calgary has a diverse population from various ethnic backgrounds, with immigrants making up 29.4% of Calgary’s population, and 33.7% are visible minorities. Over 240 ethnic origins with Chinese origins being dominant in the visible minorities category. The Calgary Board of Education governs 226 schools across the city with 114,500 students and 13,000 staff. It is the largest school board in Alberta and over twice the size of any other school boards in the province. Calgary is a nature enthusiast’s paradise, with well over a hundred public parks within the city limits. 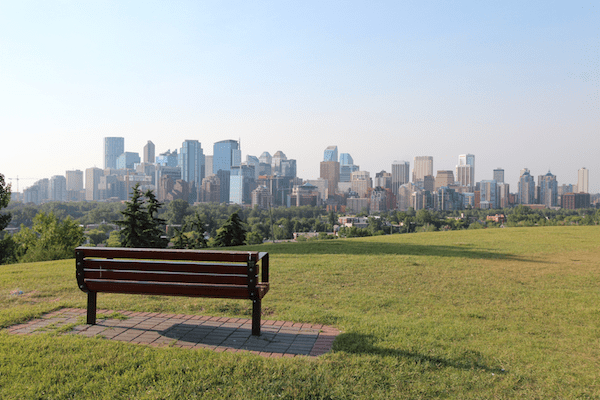 Some of the city’s most popular green spaces include Fish Creek Provincial Park, Edworthy Park, Nose Hill Park, and Princes Island Park. Fish Creek Provincial Park is Canada’s largest urban park that stretches for 19km. Prince’s Island Park is a unique island on the Bow River in the heart of the city. Similar to Toronto’s CN tower, the Calgary tower is the city’s landmark. 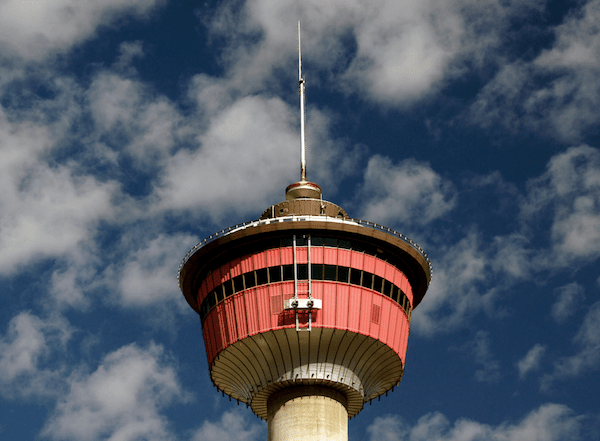 Standing at 190.8M, the Calgary tower is an observation tower that was completed in summer of 1968. It is currently the second tallest free-standing structure in Canada, just behind the CN tower at 553.3M tall. Besides just being an observation tower, there is also a 360-degree restaurant that boast specular views of Calgary’s city centre. The gas-fed fire on top its spire still holds the record for the highest Olympic flame, and still burns to mark historic occasions and sporting events in the city. The most popular retail centre in Calgary is Cadillac Fairview Chinook Centre. Here you can find major retail brands and department stores that can be found in any other shopping centres across Canada. If indoor shopping isn’t for you, locals also opt to visit Stephen Avenue, a pedestrian street at the heart of city’s core, as well as 17th Avenue SW, the main stretch for downtown dining and entertainment. 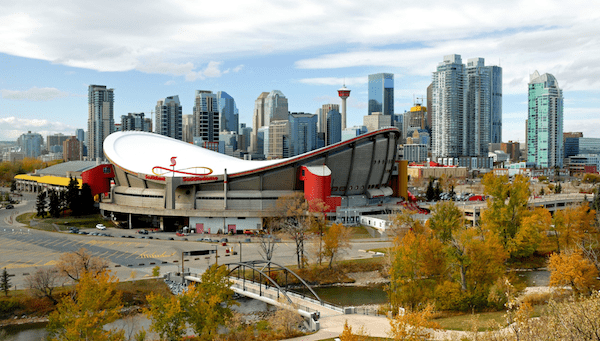 The Calgary Flames is Calgary’s professional NHL team that plays in the Scotiabank Saddledome. The team was founded in 1980 and previously belonged to Atlanta. The Calgary Flames have won one Stanley Cup and have been to the conference finals three times. The Stampeders is Calgary’s professional CFL football team. Their home field is currently McMahon Stadium, and they have won 7 Grey Cups since inception in 1945. There are currently no Canadian teams that compete in the NFL. There are currently no regulations in place for short-term rental platforms like Airbnb in the city of Calgary. As of December of 2017, there have been reports that city council members are looking to introduce regulations to the short-term rental market in Calgary, following in the footsteps of both Vancouver and Toronto. 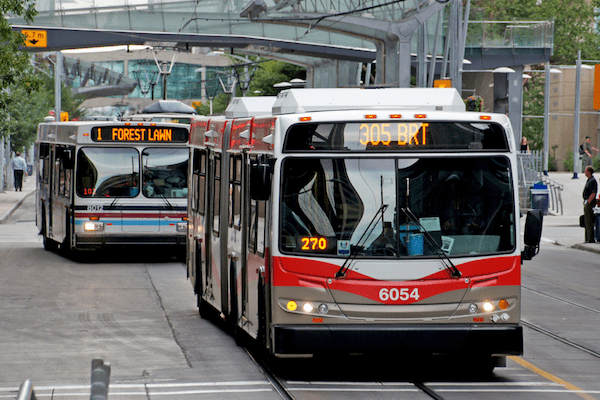 The CTrain is the light rail transit system of Calgary and operates two major routes: the Red line and Blue Line. The Red Line runs from the far southern to the far northwestern suburbs of the city and the Blue Line runs from the northeastern to the western suburbs. The CTrain operates from 5:00AM until 12:30AM on weekdays and weekends. The remaining areas that are not serviced by the CTrain are serviced by buses which run from 5:30AM to 12:30AM. A one-way fare on the Calgary Transit system is $3.15 for adults and $2.10 for children. A monthly pass can be purchased for $99 a month for adults and $60 for children. As of 2017, the CTrain is one of the busiest light rail transit systems in North America, with 306,900 weekday riders. Over 45% of workers in downtown Calgary take the CTrain to work every day. The biggest taxi company that operates in Calgary is Associated Cabs. Their white cabs can be seen roaming the streets of the downtown core. Taxis can be difficult to hail on the streets so it is best to book in advance or visit a train station or hotel where they are usually parked waiting for passengers. Uber launched in the city of Calgary in 2015 but was quickly closed down. This didn’t last long as the service was rebooted in July of 2016. Currently, Calgary offers three services: UberX, UberXL, and UberSelect. It has quickly become a preferred choice of transportation as it is cost effective and easy to use. Calgary has an extensive network of streets and highways. The largest of these is the north-south running Deerfoot Trail. A majority of highways in Calgary are named Trails. Another notable “Trail” is the MacLeod Trail that begins in Calgary’s downtown and runs south into Highway 2A. The Trans-Canada Highway is the main route that connects Calgary with the rest of Canada. It is the longest national highway in the world and stretches 7604KM from St. John’s to Victoria. There are currently 11 hospitals in the City of Calgary. Some notable hospitals include Alberta Children’s Hospital, East Calgary Health Centre, Foothills Medical Centre, Peter Lougheed Centre, Rockyview General Hospital and Tom Baker Cancer Centre.